Doug Ritter is available to make a presentation to your group or organization on a variety of survival related topics. For years Doug's presentations have been a staple at events such as AOPA Expo and EAA AirVenture Oshkosh. He is widely recognized as one of the world's foremost experts on General Aviation survival topics. Doug's low key, fast paced style, delivered with sincerity and humor, captures the audience's attention and packs a lot of valuable information into the available time. For more on Doug's background, click here. For more information on booking Doug Ritter for your group or organization, please email Doug Ritter or contact us at 480-219-7271. When your flight's gone about as bad as it possibly could, your survival may well depend upon what you have on your person, not that survival kit you so carefully packed that's burned to a crisp. Doug will give you the straight poop on the fundamental survival gear you should never be without and, just as important, what gear is worth betting your life on and what isn't. Learn what to carry in your pockets and what should be included in a personal/pocket survival kit. However you got yourself into the predicament, this will provide you the fundamental skills set needed to survive and be rescued in most wilderness situations. Focuses on practical survival skills using the fundamental survival equipment Doug recommends you carry on your person at all times. Covers shelter, fire making, water procurement, staying found, and signaling search and rescue. Complements survival equipment presentations above. 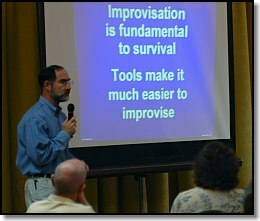 The two 1-hour presentations above can be combined for a 2-hour presentation covering both equipment and survival techniques. The two 1.5-hour presentations above can be combined for a 3-hour presentation covering both equipment and survival techniques (includes a 10-minute break). If you fly over water, any water - ocean, lake or river - during take off, landing or en route, you need to see this program. Doug is the world's leading authority on ditching general aviation aircraft. Doug torpedoes numerous myths and old wives' tales about ditching and covers the actual ditching process and egress procedures; water survival equipment; water survival strategies; overwater search and rescue procedures; the open water environment; hypothermia and other physiological concerns; psychological aspects of water survival; and hazardous marine life. 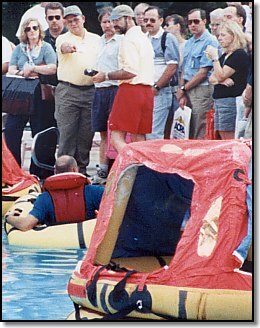 The longer programs included more information on ditching survival equipment and water survival, including demonstrations of a variety of life vests and life rafts and use of signaling and survival equipment. Signaling for help can be a lot more complicated that it seems and screwing up can have fatal consequences. Doug gives a quick overview of the various traditional signaling means as well as electronic signaling devices. He covers how they work, how to get the most out of them, and how to avoid problems that can reduce effectiveness or cause injury. Improvised signaling is also covered. Inert pyrotechnics are used for inside demonstrations. With prior arrangement and proper accommodations, actual live demonstrations can be conducted, in which case the Powerpoint portion of this presentation is optional. Personal Locator Beacons (PLBs) are now legal for use in the U.S. This revolutionary and affordable advanced 406 MHz emergency beacon technology "takes the 'Search' out of Search and Rescue," substantially improving the odds that survivors will be found and rescued in a timely manner. Doug is the nation's leading consumer expert on the subject and is uniquely qualified to speak on the subject having exposed the failings of one manufacturer's beacons in exclusive real-world testing. He covers the benefits these PLBs offer and their limitations, the various special features available and their pros and cons, how the COSPAS-SARSAT system works with these beacons, how to use them to best advantage and reviews the features of all the available PLBs. Doug also provides demonstration beacons for participants to gain hands-on experience with this latest lifesaving technology. Longer presentation includes more technical details. New technology is substantially improving the odds that survivors will be found and rescued in a timely manner. 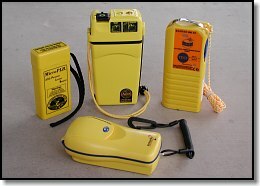 Doug covers 406 MHz Personal Locator Beacons (PLBs), Satellite Phones, improved capability Handheld Radios and high-tech visual signaling devices including Laser Flares and LED "strobes." Both the advantages and limitations of these new devices are reviewed and demonstration samples of most are provided for participants to gain hands-on experience with this latest lifesaving technology. Longer presentation includes more technical details on the equipment and field use. All presentations except those conducted outside for equipment demonstrations require a PC-compatible LCD projector and projection screen. For larger groups, generally more than 20 people, a microphone and PA system is required and a wireless lapel microphone is much preferred. If you don't have one available, Doug can provide his own wireless lapel microphone system to hook into your PA system. A 6 ft. or 8 ft. long banquet table and chairs may be required for some equipment demonstrations. Availability of life rafts and live pyrotechnics for demonstrations subject to cooperation from manufacturers, distributors, or a local service facility and generally must be arranged well in advance. Demonstrations of pyrotechnic devices requires coordination with appropriate law enforcement and SAR organizations. This can be arraigned by either party, but must at least be coordinated with Doug. For presentations where equipment is demonstrated, an assistant to help pack up afterwards is required, three assistants for the in-water demos. Clean up from life raft demos involves use of a very loud industrial vacuum cleaner to purge and evacuate the rafts for shipping. Do not schedule the same space for presentation for at least one hour, and preferably two hours, afterwards. In-water demo clean-up requires additional resources and time. For more information on booking Doug Ritter for your group or organization, please contact Doug Ritter directly.